Andrea Adamson Tiger was born at Amata, which is located on the APY Lands of South Australia, 480km to the south west of Alice Springs in 1973 to Tony and Kukika Adamson. 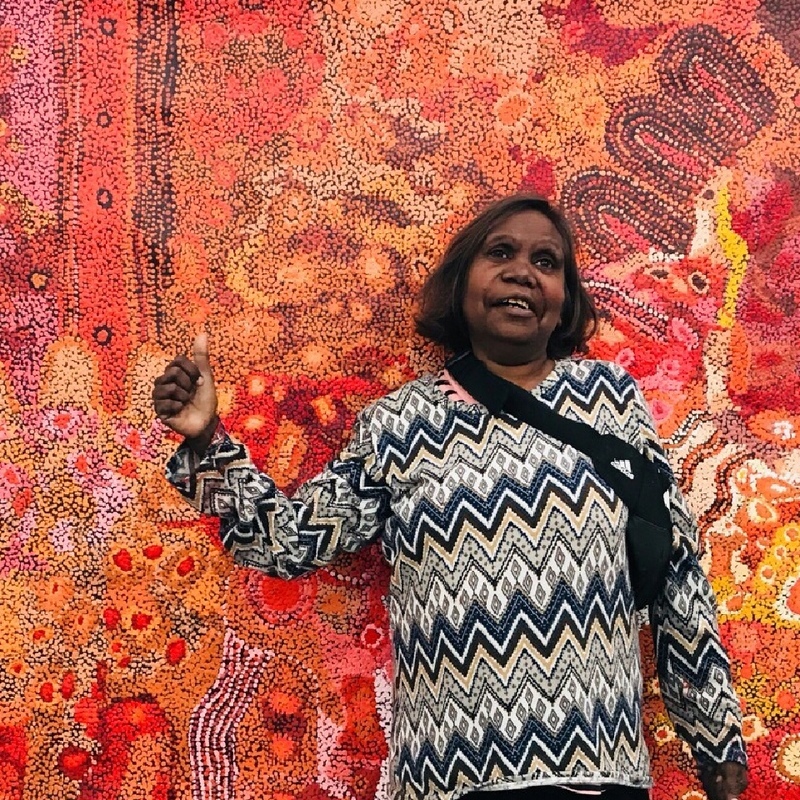 Andrea spent her youth living in Alice Springs as she attended Yirara College and spent some of her schooling in Woodville South Australia. On her return from schooling, Andrea began work at Uluru (known as Ayers Rock at the time) as a guide taking visitors around the massive rock and teaching them about the different plants, animal and customs of this area. She is very proud of her heritage and holds this time very dear to her heart. Andrea still enjoys sharing her cultural knowledge with visitors to Yubu Napa Gallery when visitors meet her. Her father encouraged her to paint, telling Andrea that she can keep the stories alive when telling them on canvas. She relishes the opportunity to do so. Andrea has a deep understanding and knowledge of the traditional customs of the Anangu people of this area. She regularly participates in the ancient ceremonies that are held on these lands. During these ceremonies, the women create body paint by grinding ochre into a fine powder. This powder is then mixed with water or Kangaroo oil before being applied to the bodies of both the men and women. Once the ceremonial body paint designs and clothing are adorned, song and dance is used to tell these important stories during the ceremonies. The different colours represent the land and the various rockholes and sandhills. Andrea tells us the story of the seven sisters and their travels through the country as they are pursued by Wati (Man) Nyiru. Nyiru saw the sisters as they travelled to the west. He fell in love with them, and even though they were of the wrong skin name to marry him, he was desperate to make them his. As the women fled from Wati Nyiru they created the country and landscape around Andrea's home, trying to trick him and escape from him. The sisters created the rockholes, sandhills and rocky outcrops as they tried to escape. Eventually they created a rock hole which went deep under the ground and came up on the other side of the hill. The women dived into the water and came out on the other side to fly up into the sky. Wati Nyiru followed them into the water, and when he came out on the other side he was too late. Now, Wati Nyiru can be seen to the south of the seven sisters, as he still chases them across the sky.